On July 26th, history is going to be made in Kingston, Ontario. The Gord Edgar Downie Pier – Canada’s first deep water urban swimming pier will be opened and a celebration for the reclamation of Kingston’s waterfront at the new Breakwater Park will take place. The realization that a waterbody that was once inaccessible and facing consistent sewage overflow can be restored to be made swimmable, drinkable and fishable is inspiring. This is a huge step forward for everyone who cares about swimmable, drinkable, fishable water in Canada. The Pier is a human-made feature in Ontario, but it reminds us of the Accidental Beach in Edmonton. The swimming pier is making headlines and changing the way we view and interact with water. It’s promoting water quality and river health for sustainable use and enjoyment. We have a world class river valley here in Edmonton with so much potential for accessible recreational water use. Hopefully the new Breakwater Park in Kingston can inspire our community to bring more people to the water’s edge in Edmonton. The July 26th Gord Edgar Downie Pier opening ceremonies will be accompanied by a Gratitude Swim. This is a time to reflect and be thankful for the water, decades of hard work, the supporters, and all the people that have made this project possible. It is safe to assume that many of us will not be in Kingston on July 26th. 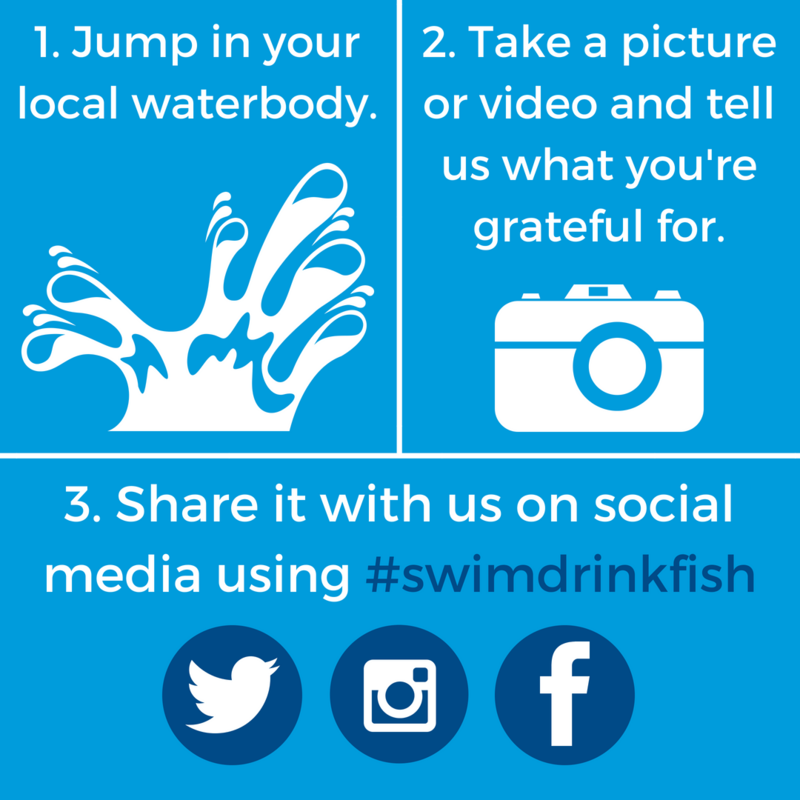 We invite you to join the celebration and participate in a Gratitude Swim at your local waterbody and to take a moment to be thankful. The reclamation of the Breakwater Park and pier proves that when people come together the unthinkable can be achieved. I really hope this project sparks a movement in other cities and communities to do something similar with their local waterbody for a swimmable, drinkable, and fishable future. Gord Downie was an ambassador and board member of Swim Drink Fish Canada. He was a driver for the swimmable, drinkable, fishable waters movement and grew up right across the street from where the new pier has been built. He also hosted the first fundraiser and launch of North Saskatchewan Riverkeeper. Gord has helped make these organisations and projects possible and it seems fitting for Edmontontonians to honour him, the river, and those who strive to keep it clean by partaking in a Gratitude swim. For more on the Gord Edgar Downie Pier and Breakwater Park project, visit Great Lakes Guide.